My life, under the microscope...: another scrimshaw Sheltie dog! I couldn't do work in progress stuff while I was working on this one, had to keep it secret. So I ended up being pretty lax about taking photos while working on it... I think I took one... I think. I wish you could all see this stuff in person. The pics are darn good, but they are soooo much cooler in person! 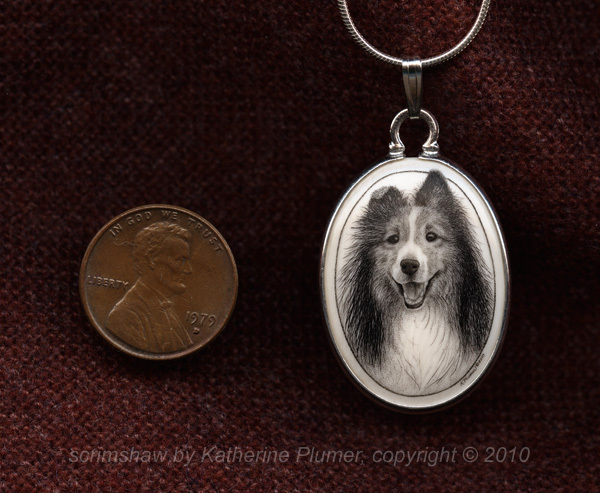 I think I might have to change the business name to "Scrimshaw Shelties by Katherine Plumer." Or maybe just scrimshaw dogs... ha ha. (I'm kidding). However, the next project after my cat is yet another dog! And a cheetah. Not together, that's two separate projects. I've been busy getting ready for Friday's art show opening. I set up everything on Tuesday and it looks great. I will have small items down there for the reception on Friday, plus I'm responsible for bringing dessert (YAY!) so I need to do a bunch of baking. Oh and I got a new bench grinder today! It's an early birthday present. It replaces the OLD one that shook so hard it rattled the tools off the wall of the workshop (yes, really, it did). Sweet. I'm not quite done setting it up yet, because I need my brilliant neighbor to help me with something, but soon I will be able to sharpen gravers, woo hoo! I ordered another pack of blanks and one more template, so I'm excited about being able to try out different graver geometries. So far I've been abusing practice plates with a, uh... I think it's a 126° graver. I'm getting a teensy bit better, but definitely want to try some other things to see what different tools produce.